The Big Short isn't for the faint of heart. The comedy-drama hybrid about the housing crisis and financial crash of 2008 starring Steve Carell, Ryan Gosling and Brad Pitt, is certain to have people talking. Based on the book by Michael Lewis, The Big Short tells the true story of a group of men — some Wall Street bankers, some not — who decided to flip the script and bet against the housing market before the crash. The film, which repeatedly breaks the fourth wall, looks larger than life, but all the big name stars in the film play characters based on real people, including Pitt, who stars as retired banker Ben Rickert. Rickert is actually based on Ben Hockett, a banker who joined forces with his neighbors Jamie Mai and Charlie Ledley in establishing Cornwall Capital Management, an investment fund that struck gold with their bets against the housing market. So, what does the real Ben think of The Big Short ? Hockett hasn't spoken out about the film yet, so it's unclear how he feels about being immortalized on film and I'm not sure we'll ever know his take because the real Hockett has kept his distance from the spotlight, and is now a survivalist living a quiet life in Berkeley, Calif. According to Pitt's interview with Vulture, Hockett lives in a home that is impossible to access by car. Given Hockett's solitude, I'd wager that it's unlikely he'd approve of being made into a product of Hollywood. 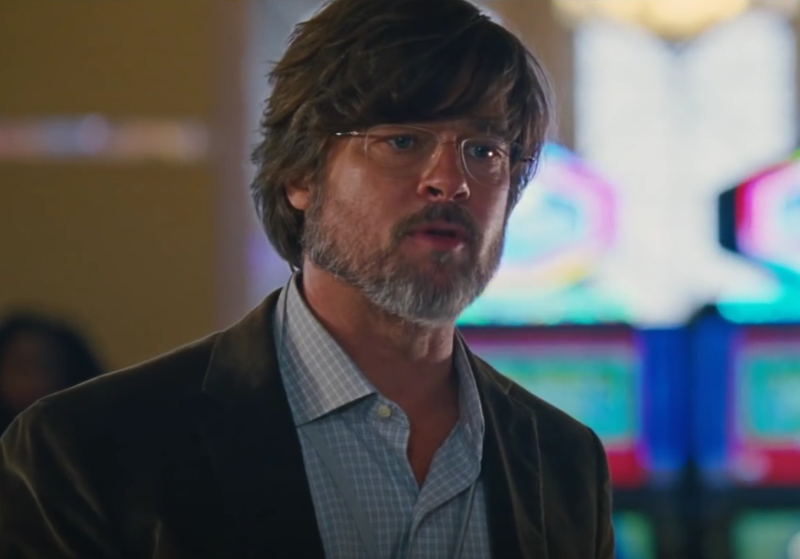 It might seem like anybody lucky enough to be played by Pitt in a movie wouldn't have anything to complain about, but, to be fair, Pitt's turn as Ben Rickert in The Big Short isn't the actor's most glamorous turn. Dressed in ill-fitting suits with clear glasses and a grey beard, Pitt embraced the look of a bored professional for the film. Still, despite any makeunders, it's hard to think that Pitt's casting would be a point of contention. It's more likely that Hockett would be concerned with how audiences respond to the character of Ben Rickert in The Big Short . On the one hand, The Big Short can be seen as a story about underdogs and outcasts who beat the system. This narrative of the regular guy profiting off of the corruption of big banks is certainly how The Big Short is being sold to audiences, as evidenced by the early trailers released for the film. On the other hand, The Big Short is a story about brilliant minds who predicted the housing crash and didn't stop it. It's unclear how director Adam McKay wants audiences to feel about The Big Short 's protagonists. Should we hate them for profiting on such a horrible event? Or should we applaud them for beating corrupt institutions at their own game? Hockett and Cornwall Capital walked away from the financial collapse with $80 million — 80 times their $1 million investment. McKay addressed this conflict in an interview with LA Times, saying only, "That's my favorite thing about the movie. I'm a big believer in not using cartoon heroes. Julian Assange is kind of a creep, but he did some good things. I'm sure if you went back and met Hercules you may find he's kind of a [jerk]." Sure, comparing Hercules to a hand full of white bankers might be a bit of a stretch, but, just like Hercules, only time will tell whether or not the characters in The Big Short will be regarded as villains or heroes.